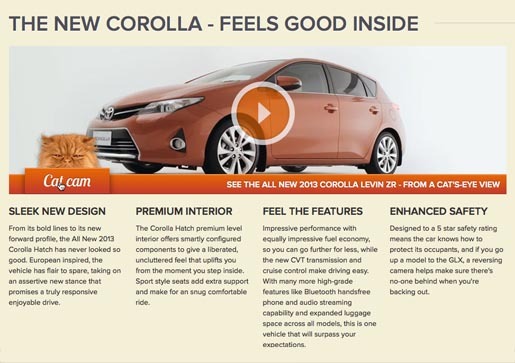 Toyota New Zealand is promoting the All New 2013 Toyota Corolla Levin ZR with an integrated advertising campaign centred on a fluffy ginger cat named Alloroc (Corolla backwards). Some people know a good thing when they see it. So it goes for our furry friend Alloroc. 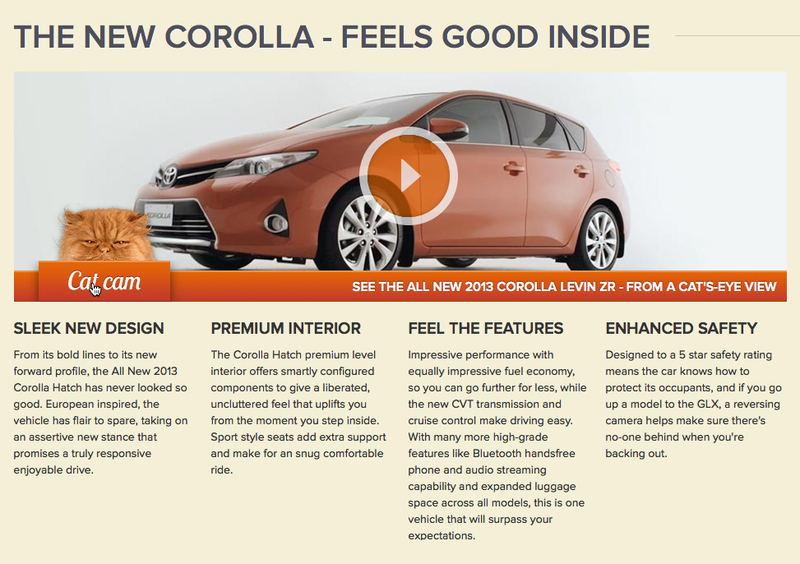 An everyday trip to the vet led to Alloroc falling immediately in love with the Corolla’s premium interior. 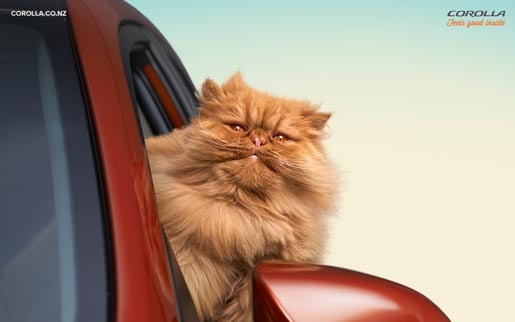 This chance encounter held long-lasting consequences for our four-legged connoseur of the finer things in life. 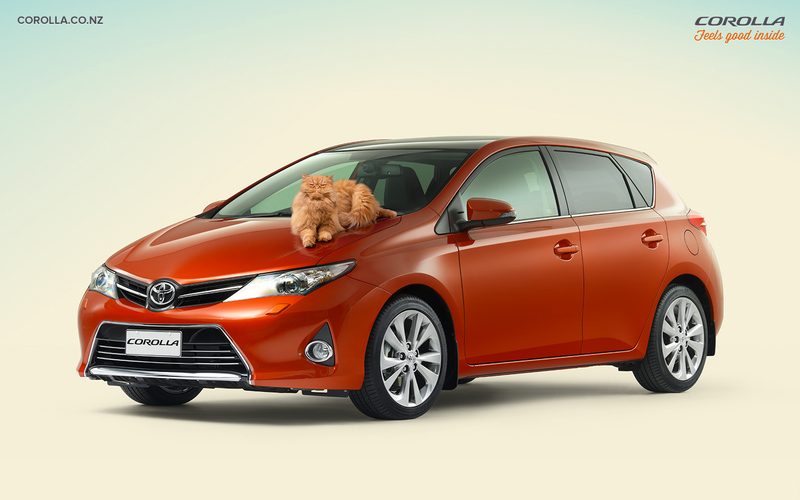 Like many Corolla drivers, Alloroc’s refusal to be separated from his Corolla meant he went on to enjoy many many feel good moments. 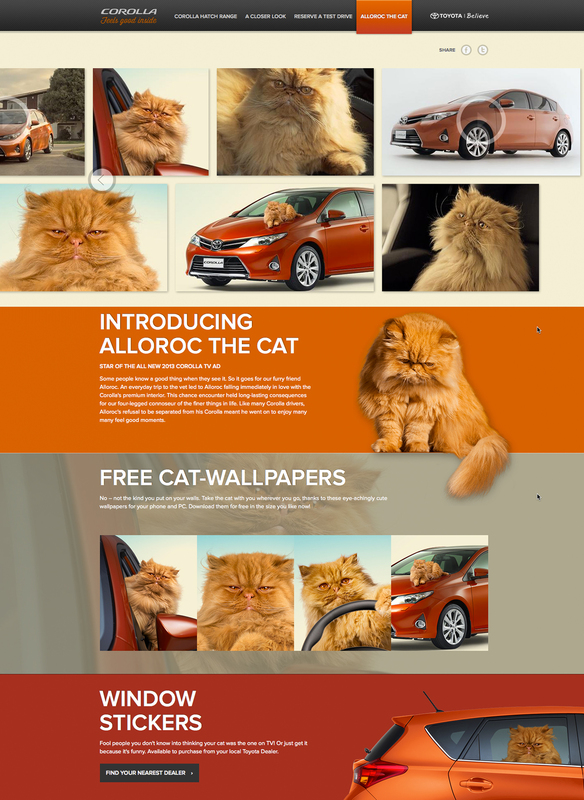 Centred on the microsite, corolla.co.nz/alloroc-the-cat, the campaign is rolling out through television commercials, Facebook (facebook.com/ToyotaNZ), YouTube (youtube.com/user/ToyotaNZ), print, outdoor, and point of sale (Cat car stickers) over the next 6 months. The Cat commercial was developed at Saatchi & Saatchi NZ by executive creative director Antonio Navas, art director Emily Drake, copywriter Sarah Litwin-Schmid, creative director/art director Guy Roberts, creative director/copywriter Corey Chalmers, head of content TVP Jane Oak, planner Murray Streets, group account director Mark Cochrane, account director Emma Guadagni, working with Toyota NZ general manager of marketing Neeraj Lala, marketing manager Andrew Davis and new vehicles marketing team leader Michael Shepherd. Filming was shot by director Hamish Rothwell via Goodoil Films with producer Sam Long, director of photography Crighton Bone. Post production was done at Blockhead by VFX supervisor/artist Nigel Mortimer . Editor was Peter Sciberras. Music was by Elliott Wheeler at Turning Studios. Sound was produced at Liquid Studios by sound engineer Craig Matuschka. Digital work was done by Aim Proximity Wellington. 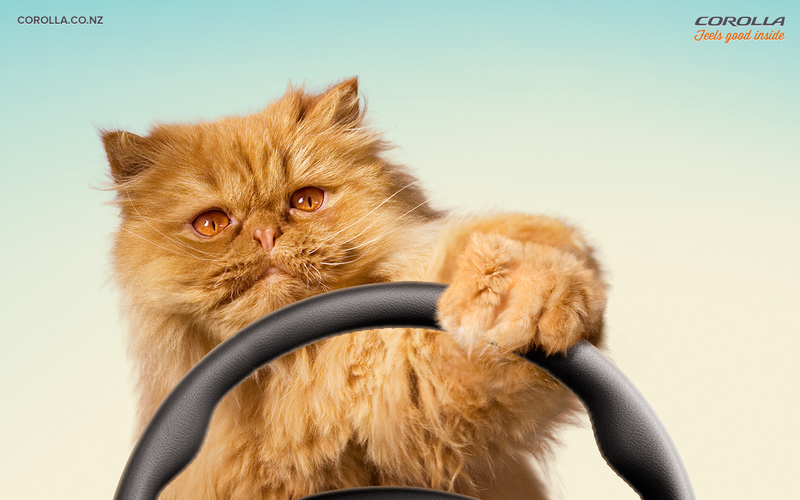 Animal trainer Caroline Girdlestone worked with six identical cats. Media was handled by Starcom. PR was handled by Wright Communications. L’amour﻿ me tranche de sa lame. L’amour, c’est le souffle qui me fait respirer à nouveau. Mais ce que je fais, je le fais par amour. C’est étrange mais l’amour a sa propre anesthésie. C’est l’amour, c’est l’amour qui brûle derrière les yeux de cet homme. Love has sliced me with its blade. Love is the breath that makes me breathe again. But what I do, I do it for love. It is strange﻿ but love has its own anaesthesia. This is love, this is love that burns behind the eyes of this man. Love! love! This is love!